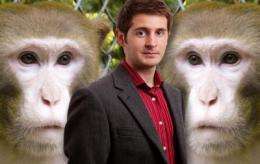 In the first study of its kind in an animal species that has not passed a critical test of self-recognition, cognitive psychologist Justin J. Couchman of the University at Buffalo has demonstrated that rhesus monkeys have a sense of self-agency -- the ability to understand that they are the cause of certain actions -- and possess a form of self awareness previously not attributed to them. The study, which will be published July 6 in Biology Letters, a journal of the Royal Society, may illuminate apparent self-awareness deficits in humans with autism, schizophrenia, Alzheimer's disease and developmental disabilities. Here's looking at you, fellow! Parakeets will play with the bird in the mirror and some fish will attack the other fish in the mirror but a dog or other larger brain animal will ignore the mirror perhaps because they know it is just a reflection because of expiriance with pools of water. Perhaps human standards of reaction to a mirror apply only to humans. Experiments with mirrors have no scientific values. Animals in general don't care about mirrors, it's alien to them. Until a better experiment is designed we can't conclude anything about consciousness in animals. My own opinion is that animals in general ( those with complex brains ) are self-aware. Just look at your dog or cat or what not. Self-aware or not, those chocolate & peanut butter things they make are great. This is not meant as an insult, but I think psychology as a science knows even less than economics. Maybe the human mind studying the human mind doesn't see the forest for the trees. While physics, medicine and especially mathematics can be proud of their state of the art, psycology is at the stone age. This is especially unfortunate now that society is becoming unlivable by the humans in it, as seen from the skyrocketing sales of antidepressants and other drugs of the mind -- and suicide and homicide rates. The mirror test is deeply flawed. Animals like my two cats would fail the test, because they ignore the mirror image completely. And yet, their lack of interest shows clearly that they know that the mirror image is not some other cat. They'll communicate with any cat except the one in the mirror. When they meet each other, they always greet each other, either by smelling each other or by lifting their tails in greeting. If I bring in an unknown cat from outside, they'll hiss and threaten aggressively. The cat in the mirror is the only exception. What's more, the mirror test checks for far more than just self-awareness. It requires several steps of abstract reasoning to understand that a viewed image can represent oneself, that the spot on the forehead may be present not only on the image but also on oneself, that the spot represents a change from one's previous appearance, that removing the spot may be interesting or desirable, that removing the spot may be possible, and so on. Oh, and there's one more problem with the mirror test for self-awareness. It doesn't check for self-awareness. Consider a different test. In front of a mirror you place an animal to be tested, then a wall, then a sibling, friend or doll with a spot on its forehead. The tested animal can see the sibling, friend or doll through the mirror, but not through the wall. Suppose that when you've set this up, the tested animal reaches behind the wall to touch the spot on the companion's forehead. Clearly this does not prove self-awareness, since the animal isn't turning its attention toward itself. It also doesn't prove awareness of otherness, i.e. awareness that companions are similar to self, since the companion can be a doll. All it proves is awareness that a spot that is seen in a mirror may be reachable by touching a real spot, rather than its mirror image. That's certainly a very interesting observation, but it says practically nothing about self-awareness or awareness of otherness. I once stopped at a mall so I could observe people in an elevator with a large mirror. Almost all of the women at least glanced at themselves in the mirror, and most of them touched their hair or face or clothing. Less than a tenth of the men paid any attention to the mirror or their reflection there. Seems cognitive psychology scientists work in a place without public mirrors. After moving the cursor, both humans and monkeys were asked to identify the computer cursor that they controlled -- the one that matched their movements and intentions. Hmm, I wonder how the monkeys were asked that question? What is it that separates us from the animals, again? They could have laid out several outfits for the monkeys to try on. A problem with the mirror self-recognition test is it is anthro-expectant. We are socially and visually oriented to the face-it matters to us like few, if any, other species. Our visual acuity is also greater than most other mammalian species. However, I am not seeing mention of the recent surendipity of other experiments, that installed monitoring equipment on the heads of monkeys (for a different purpose) that resulted in mirror self recognition type behavior in front of the mirrors placed in the cages for the monkeys' amusement. The researchers hypothesis for this is "super stimuli" (I'll call it a clue x 4) is drawing the relevant attention. I am also thinking of an experiment were the researcher hypothesized that altering a species conspicuous identifying feature, in this case, dyeing the cotton top of cotton top monkeys, would be relevant to the individuals and would result (as it did) in mirror self-recognition behavior. The current small mark test is inappropriate. That might just mean the cats don't care. A cat knows the difference at least between a picture of itself and a mirror image. It knows it sees a real cat in the mirror as opposed to looking at a photo of itself. Some cats are smart enough to realize they aren't looking at another cat, check this video, he not only sees himself, but looks at the objects he recognizes( from the room ) in the reflection, then checks the edge of the mirror. Can it fathom a mirror ? Idk, but it for sure doesn't think it sees another cat. And if men wore makeup and fancy hairdoos like gene simmons they would be checking themselves out more. So what? That could be developed into an interesting set of experiments, if it hasn't already been done.